Evening Grosbeaks - Creepy Clowns of the Adirondacks are Baaaack! Happy New Year to regular readers and anyone who stumbles on this blog about the nifty and sometimes awe inspiring Adirondack lifestyle! I didn't forget; what do you think I am, a bird brain? I am just running a little behind. The winter pace is pretty busy for an obsessed skier living in Lake Placid, New York. It is not just skiing keeping me so busy these days. The real estate business has me hopping as does keeping track of the eerily large flock of Evening Grosbeaks who have descended on our feeder over the past few days. I was startled the first time I saw an Evening Grosbeak at our feeder more than 15 years ago. Evening Grosbeaks are relatively large birds and I think the male looks like a jealous clown. They are beautiful birds, but they creep me out. OK, truth is, birds have scared me since I was seven and saw the Hitchcock movie, The Birds, but that is another story. I am not a birder per se; I like to hear them sing and see them in small groups, at a distance. The Grosbeaks had not been around my feeder for a couple years and I wondered if someone else shared my discomfort with their looks and took matters into their own hands. Apparently that is not the case. 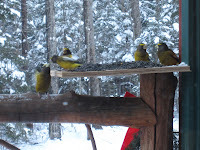 I've learned my Evening Grosbeaks are common irruptors and they are on an irruption looking for eats. It is generally believed that irruptions are driven by a lack of food on the normal wintering grounds. Whatever you call it, there are a ton of Evening Grosbeaks pigging out at my place.